Specially designed for synthetic surfaces, the Brush-Pro is a ride-on brushing system consisting of a pair of mid mounted oscillating brush units and three rear mounted brushes. The oscillating brushes are ideal for periodic aggressive brushing to keep infill mobile, prevent algae accumulation, surface compaction and loss of porosity. action” is designed to be thorough and effective but gentle to avoid damage to the fibres. Fewer passes are required than when using conventional drag brushes causing less compaction. The rear mounted brushes are designed for routine frequent use to lift the pile. Natural and artificial sports ground contractor, White Horse Contractors, continually invest in specialised plant and machinery. This policy has seen the Northern arm of the company recently purchase a SISIS Brush-Pro ride-on brushing system and SISIS SSS1000 towed rotary brush sweeper for all regular synthetic surface maintenance contracts. Dennis and SISIS will again be exhibiting and demonstrating their range of world class turf maintenance equipment at Saltex 2012. Visitors to the stand will be able to view an upgraded and improved version of the SISIS ride-on brush system which is designed specifically for the maintenance of synthetic surfaces. 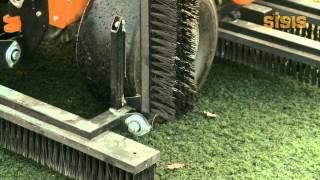 This video demonstrates the SISIS Brush-Pro in action for synthetic turf maintenance. The Sisis Brush-Pro is a ride-on brushing system comprising a pair of mid mounted oscillating units and three rear mounted brush units that that have been specifically designed for maintaining synthetic surfaces.